By now, even those of you living under a rock have likely encountered the next game in my Hobo Gamer series – Crowfall, the new upcoming MMO currently under development by ArtCraft Entertainment. 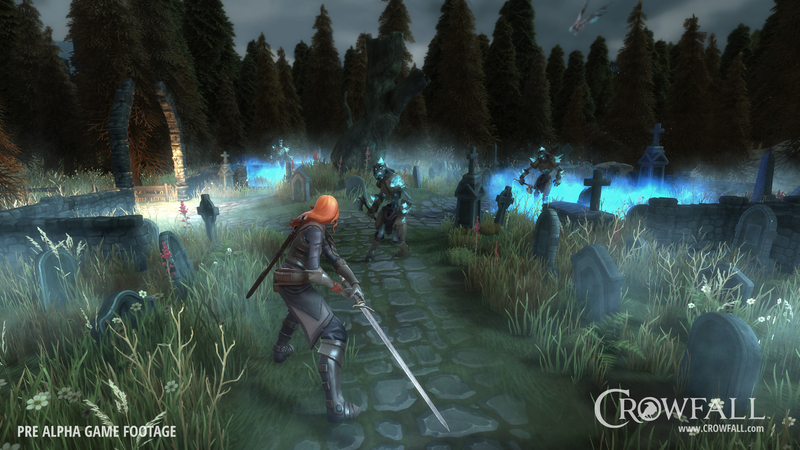 Having just completed its Kickstarter with abundant success, Crowfall now enters the long march into serious development, with fans – particularly those from old-school PvP MMOs – electrified by ArtCraft’s updates on the game in about the same way as young women receiving unexpected Christmas gifts from Taylor Swift. So what has everyone excited? Brought to us by Creative Director J. Todd Coleman (Shadowbane, Wizard101, and Pirate101) and Executive Producer Gordon Walton (Ultima Online, The Sims Online, Star Wars: Galaxies, and Star Wars: The Old Republic), Crowfall aims to create a unique blend of old-school, strategic, community-driven sandbox PvP borrowing elements from EVE, Star Wars: Galaxies, Shadowbane, and Sid Meier’s Civilization. Marketed as “Game of Thrones meets EVE Online”, Crowfall‘s main draw is its pitting of players against each other in wars for resources and territorial supremacy over the game’s worlds. One of Crowfall‘s pillars of design is that in previous iterations of similar designs (most relevantly, Shadowbane), no matter how close an MMO came to simulating the experience of a strategy game, one key difference has always set them apart; games of Civilization, Risk, Settlers of Catan – you name it – crucially, all come to an end. In these strategy games, rather than settling into a stale endgame wherein one player or alliance of players has become an unassailable tyrant, these games simply end, a winner is declared, and another round is begun. It is ArtCraft’s intention to bring this principle to the MMO genre. Frankly, this elicited quite a bit of skepticism on my part. I’m a big fan of persistence, and I’m not too big on anything that sounds like instancing. Thankfully, I dug deeper, and I think I’m on board with what ArtCraft has in mind. Most of the game’s warfare will take place in the campaign worlds – seamless, instance-free, persistent world spaces where groups of players will fight it out for gold and glory. These maps are procedurally generated in what appears to be a similar method to Diablo III‘s randomization, in which pre-made pieces of the map are procedurally adjusted and fit into the world space to create a unique play experience each time. The campaign worlds are reported to be massive – similar in size to entire continents in other MMOs. Some men just want to watch the world burn – they’ll be afforded ample opportunity. At the start of a campaign, players will be dropped into the world with limited items (or none at all, depending on the ruleset), and are left to find their own way in a completely new world. In a move reminiscient of the game’s strategy inspirations, until they have explored it, the campaign world’s map will initially be covered in the fog of war. At the start of the game, players will want to seek out strategically valuable areas such as defensible fortresses or resource nodes to set up shop. These campaigns will be measured in months, not days or weeks. Though the ultimate length will vary by campaign, expect to see durations ranging between a month and a year. That’s right, it’s another voxel MMO – but before the collective groaning begins, let me assure you that Crowfall has no Minecraftian aspirations; while Voxel Farm’s technology will be used to allow players to permanently alter their world with the construction of forts and cities, this feature will be limited to plopping down and combining pre-made building elements. The real benefit of voxels in Crowfall comes not from its power for creation, but from its darker half – the potential for destruction. Through this technology, players will be able to employ a new level of strategy, with the option to permanently destroy or tunnel beneath an enemy’s walls when looking to conquer a settlement. Interestingly, the fact that the world will eventually end greatly opens up the ability for players to permanently change the game world in this way – it’s all going away eventually anyway, after all. Now this is where it really gets interesting. In the Crowfall lore, The Hunger is an unknown force at the center of the game’s universe slowly consuming the worlds, corrupting and twisting the creatures surviving on those the worlds as it goes. As the campaign marches towards its end, the hunger strengthens, increasing mob difficulty and decreasing resource availability. Visually, this is represented as the transition of seasons in the game; all campaigns are a progression from a bountiful spring to a cold winter, bringing with it the end of the world. Because what would a Game of Thrones inspired game be without being able to constantly say “winter is coming”? Speaking of hunger, the other kind of hunger is a factor as well, as Crowfall will feature survival mechanics in some form. Plan to stockpile food reserves in the spring, or by winter, you’ll find your character weakened, or worse. 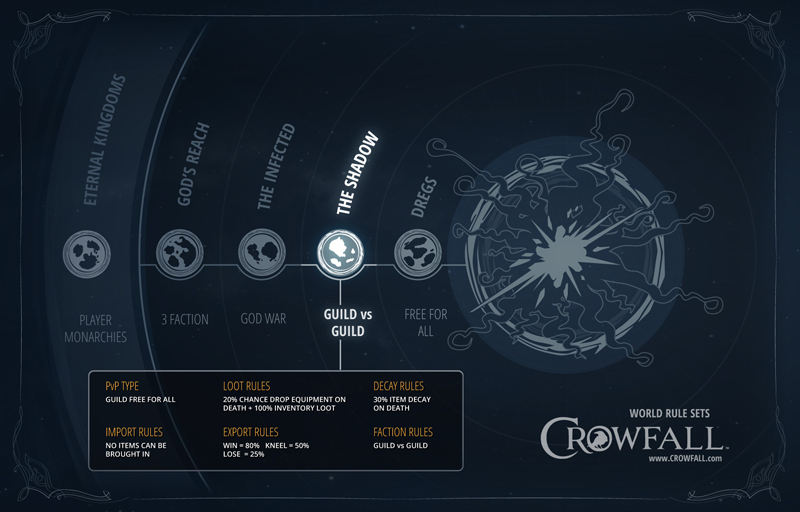 Crowfall is planning to launch with a variety of campaign rulesets, all with differences in duration, what you’re allowed to enter with, death penalties, and how much you’ll be rewarded for participating (generally, higher risk and difficulty leads to higher reward). These have all been shown visually using a series of concentric circles, increasing in difficulty as they narrow, growing in proximity to the hunger-infested center of the universe. In summary, there are four major categories of campaign world, as listed below. Check the two linked images for examples of how rules could vary across different campaigns. Note that these are just examples, and correlations between the specific rules and which tier they’re in now really shouldn’t be read into (God’s Reach having a more punishing looting ruleset than The Shadow probably isn’t going to be the standard). That said, one of the greatest strengths of temporary campaigns is the ability to experiment with varying rulesets; if it doesn’t work, they just won’t run that ruleset again. The folks at ArtCraft have expressed an interest in a great deal of experimentation with these, even suggesting unique rules like a campaign where gunpowder has been invented, or where magic doesn’t exist. In Crowfall, the players assume the role of immortal champions of gods who, faced with a new potentially universe ending threat, did the logical thing and went to war with each other instead of trying to stop it. These champions are essentially scavengers, picking over the remains of falling worlds to salvage what resources they can before all is overtaken by the hunger (this is the source of their eponymous nickname – the Crows). Players can place items, resources, and materials into Embargo – basically, this is a way of “uploading” items to your Account Bank inside a Campaign. This can only be done at certain specific locations inside a Campaign, and items placed there are basically “in quarantine” until the Campaign is over. When the world is destroyed at the end of a Campaign, some portion of the player’s winnings (i.e. the contents they have placed inside their Embargo vault) will be transferred into that player’s Account Bank. The number of items transferred depends on how well that player fared within the Campaign. Once the campaign has ended, you’ll be able to make use of your retained resources back in the Eternal Kingdoms, an area of player-run maps that we’ll cover later on. Worthy of note is one relevant stretch goal, through which caravans were unlocked as a feature. Though specifics aren’t yet available, it appears that these will be used to transport large quantities of goods in the world, and may be needed to interact with embargo vaults. Suffice it to say, transporting resources and goods via caravan will be a risky endeavor, essentially advertising the quantity of items being carried to any would be gankers who happen to see it. Traveling with guards would seem advisable. Although the worlds themselves are temporary, the concept of character permanence is still preserved. Build customization in Crowfall is incredibly deep, drawing heavily on Shadowbane, Star Wars Galaxies, EVE Online, and pen & paper RPGs. As in so many other games, your character begins with your class choice. In Crowfall, these are called archetypes, and are a combination of class, race, and in a few controversial instances, gender (note: this is said to generally only apply monster races, or in instances where it is supported by the lore). At the time of this writing, there are currently 12 archetypes listed on the archetype page, with more (minotaurs were one of the stretch goals) confirmed to be on the way. For races, we so far have humans, giants, elves, rodent-people, deer-people, bearded stone-dwarf people, centaurs, and minotaurs revealed. 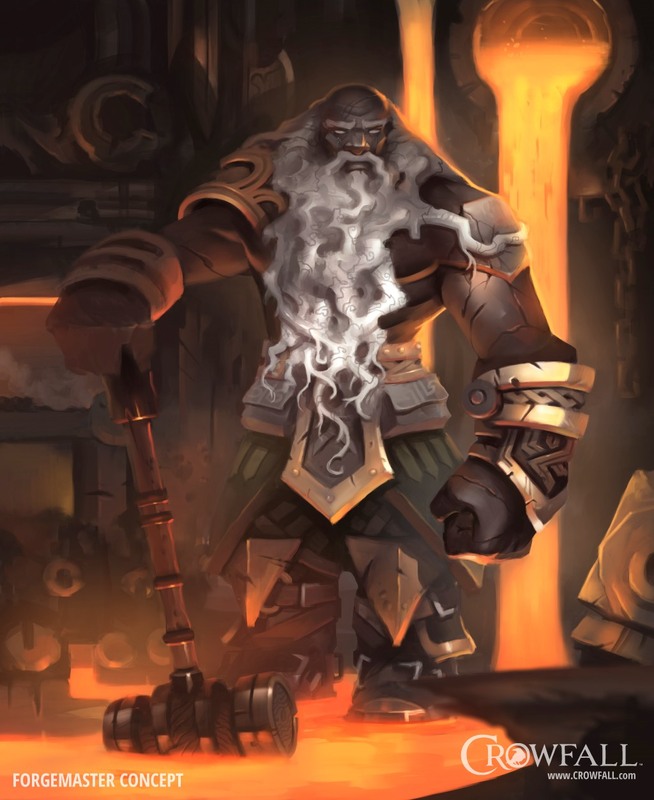 The decision to race-lock classes into archetypes brings with it two major benefits. The first is that it allows for much higher quality work to be done on animations and armor skins (if determined by class ala Warhammer: Online – which could be the case, though this is speculation), as they will only have to be used on one similar model instead of tweaked to fit many different ones. Second, it signals that classes will be much more quickly recognizable on visual appearance alone, adding greatly to the strategy of PvP encounters by allowing players to know more about their opponent prior to beginning to fight. Crowfall‘s characters are designed on a point-based system in the style of many pen & paper RPGs. Each character starts off with a set number of points to allocate, some of which are consumed when selecting your archetypes. 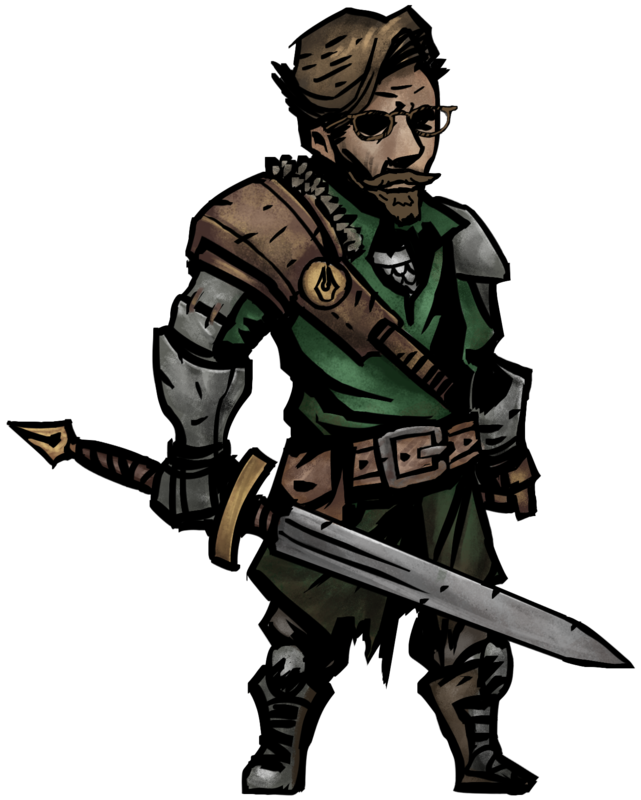 Some archetypes come with more attributes pre-distributed, and these will have a higher point cost; for example, the Centaur Legionnaire will have a high starting strength, so the point cost for choosing that archetype will be higher than when choosing a different archetype with less points already assigned. After selecting an archetype, it’s time to distribute your remaining points. You’ll be able to select of a series of advantages and disadvantages to apply to your character; advantages will consume points and disadvantages will give you points – but at a cost. The example given is that “Eagle Eye” might give you an increase to accuracy with ranged weapons, while “Dim-witted” might lower your Intellect, but give you points that you can spend to further increase your Strength. There is a limit to how many advantages and disadvantages you’ll be able to start with, so you won’t be able to get too crazy here. This smurf-elf seems to be armed with some sort of elaborate cat toy. 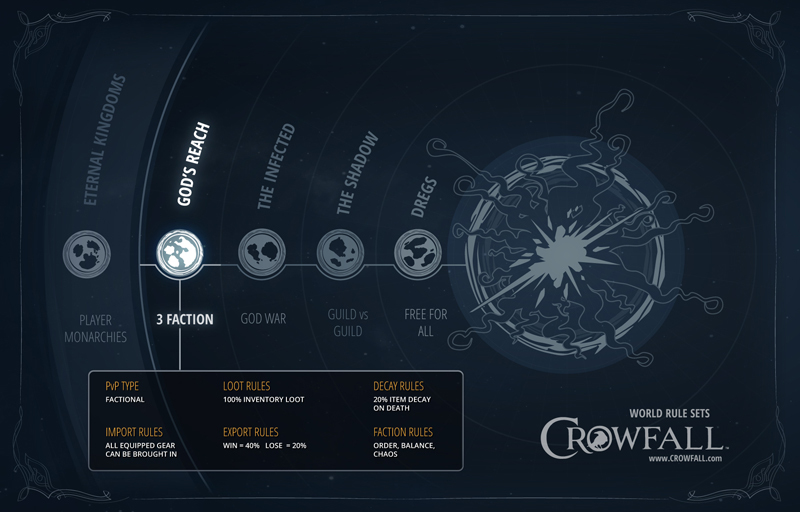 As you may have guessed already, Crowfall will feature a level-less progression system. I think we can all agree that a level-based system for a PvP based game where players are dumped randomly into procedurally generated campaign worlds would make absolutely zero sense. However, there are skill levels aplenty, which will be the first way you’ll begin to grow your character. After unlocking a skill for training (by using them), you’ll be able to queue them for advancement similarly to EVE Online‘s training system, where selected skills advance in real-time, regardless of whether or not the player is actually logged in. In Crowfall‘s system, you’ll be able to train three skills simultaneously, at three separate priority rates (secondary and tertiary functioning at essentially 2x and 3x the primary training rate). Tentatively, the team is planning for it to take one month of training on the primary track to max out a skill. Notably, the maximum attainable skill rating will be determined by other factors in your character build; not all class combinations will be able to reach the same proficiency with skills. Training is affected by two forms of diminishing returns that we know of so far. First, the marginal bonuses granted by skill training will decrease as the skill advances, with the initial levels giving much greater boosts in power than the last ones. Second, training time per level will increase as the skill is advanced, resulting in a much higher time investment to finish a skill off than it took to start it up. Similarly to EVE Online, this will result in a system where (contrary to popular opinion from players who don’t actually play EVE) players will be able to quickly get into the action, as the minimum skill investment to become competitive will be relatively quick to obtain. Check out the skill training Kickstarter update for more info. After meeting certain (likely skill-level related) requirements, players will be able to permanently promote their character into a new, specialized promotion class for their archetype. That’s right – you can put a bird on it. Promotion classes offer a wide and impactful array of bonuses to the character’s build, including raised skill maximums, new powers / upgrades to existing ones, and sometimes access to entirely new weapons. Promotion also offers one chance to adjust your character’s advantages and disadvantages, after which those choices will be finalized. Disciplines seem to be a system copy and pasted directly out of Shadowbane – one of the few areas of Shadowbane qualifying for the old if it ain’t broke, don’t fix it adage. Disciplines allow you to further customize your characters skills and powers. Want to focus that Knight on more sword damage? Or increasing his Strength attribute? Or turning into a Werebear? These are the types of customization effects that can be added by using Disciplines. Discipline runes can increase your skill max with certain skills, grant access to new skills and powers, grant you new crafting recipes, or give you the ability to master weapon types that are normally restricted. The skills, powers and recipes granted by Disciplines are typically very thematic. For example, we wouldn’t have a generic “Weapon Master” discipline that gives you a bonus to swords, spears and shields – but we might have a “Gladiator” discipline that does exactly that, because it makes sense that a Gladiator might have that particular collection of skills. The exact method for obtaining a Runestone varies; they can be found hidden in ruins or when tunneling underground, some can be crafted, and others can be obtained as rewards from victories in the campaign worlds. Like all items in Crowfall, Runestones can be traded, but as there is no way for them to be removed from a character without their destruction, the item is effectively destroyed once slotted. With all of these opportunities for customization available, how will they all possibly be balanced? They won’t be. ArtCraft has confirmed that not all builds will be good (obviously), signalling that they won’t be attempting to make every build a valid one. In every MMO, balance is a bit of a zero sum game between homogeneity and the dominance of cookie-cutter builds; with any luck, Crowfall will find the right spot. If you hadn’t gathered yet, Crowfall is a PvP game, with very little available in terms of PvE content. Mobs in the game are described as being akin to the zombies in The Walking Dead – they add flavor to the world and tune up the risk factor, but other players are the real challenge. As such, a PvE system like the trinity just doesn’t make sense as a design choice. Pictured: the blowing walls apart role. Crowfall does have roles, however. Tanks, Damage Dealers, Support, Scouts, Control, and Crafters will all play important roles in the game’s meta. Notably, Crowfall will not feature traditional healers; while players will be able to assume important support roles and healing can absolutely be a part of that, do not expect to funnel “fire-hose style” healing into targets to keep them alive indefinitely. Crowfall wants to keep the combat deadly, and as the game isn’t designed around players fighting bosses with enormous HP pools, there just isn’t any need for the sustained healers we find in many games with a PvE focus. Beyond their aforementioned function as loot repositories, Crowfall‘s Eternal Kingdoms are the game’s take on permanent worldspace and player cities all rolled into one. Each player is granted an account-wide EK to expand upon and develop as they wish. Each kingdom is essentially a smaller, permanent, low-difficulty version of a campaign world, where players will be able to build, explore, and even fight monsters if they wish. However, growth in the Eternal Kingdoms will require resources from the campaign worlds, forcing players to either compete in the campaigns or trade with others to get the materials needed for expansion. Players with developed kingdoms will be able to rent out portions to other players, allowing them to edit the features in their domain, and even sublet to other players. We will undoubtedly see the rise of prominent Eternal Kingdoms as the primary method for trade and socialization within the game’s Eternal Kingdoms. Given that there is no auction house, player-run shops (manned by NPCs) will be essential to the trade economy, similarly to their function in Star Wars Galaxies. Notably, there also seems to be a way for kingdoms to go to war with each other, though the details on that remain hazy. Controversially, the sale of structures and parcels for use in Eternal Kingdoms looks to be a major facet in ArtCraft’s crowdfunding strategy, similar to the sale of ships in Star Citizen. For many, this toes the line of the what’s acceptable to sell and what isn’t, and has some worried that success in establishing a prominent kingdom will be heavily weighted in favor of backers that invested large amounts of money prior to the game’s launch (and potentially after, if such sales are continued). While success in the Eternal Kingdoms will not directly affect progress in campaigns (remember – what you can bring into a campaign will be extremely limited), some still fear that this treads closely to becoming pay-to-win. For more information on Eternal Kingdoms, check out the Eternal Kingdoms Kickstarter Update. Crowfall‘s crafting and economy are based heavily on EVE Online and Star Wars Galaxies. If that didn’t get your attention – it should have. Crafting will be a central part of Crowfall‘s gameplay, with teams of players relying on crafters to provide them with gear, city building, siege weapons, and even food (remember that starvation mechanic?). That said, many of the specifics on Crowfall‘s crafting system are still under wraps. I suspect the Forgemaster may have crafting bonuses, but this is wild and unfounded speculation. Back in January, Thomas Blair, Crowfall‘s design lead, gave a telling interview on the game’s crafting to MMORPG. The interview is worth the read, but here are two highlights that I feel shed the most light on the game’s crafting system. What do you think happened to the crafting scene in MMORPGs? It really came out of the need to make sure that every player could be an island, and not have to rely on other players for his or her progress. If every player can play the game completely independently, then it stands that crafting should be a “secondary activity” for everyone, not a primary profession for anyone. If you wanted to be a master crafter, you had to do that in addition to gaining combat levels through PvE. Since it was an optional secondary profession, the endgame “evolved” from dealing with other players (or beating on them and taking their stuff) to forming large groups and killing raid bosses for phat loot. Thus began an eternal struggle between loot drops and crafted items. There can only be one! Crafted items better than dragon loot?! Preposterous! Take a boss drop to a crafter to craft it for you? No way! Of course, loot drops won out, because it’s easier to control the player experience by setting drop percent chance. In fact, loot drops won out so convincingly that crafting is mostly used to fill in equipment gaps while waiting for raid boss loot drops. How sad is that? To relegate a primary game profession to a sad time-filling activity? As designers in our desire to make killing big monsters worthwhile we killed the concept of having a crafting class as “the thing you do.” We have replaced depth and community interaction with clever and in some cases very good mini games. How you craft is where we have been focusing all our efforts, not why you craft. Speaking as a player who made virtual fortunes in UO as a Blacksmith and in SWG as an Armorer, I’m bummed I can’t find an experience like that in the current marketplace of games. No one knows who the crafters in the community are, there is no debate on how to produce masterpieces in the forums. People think of the exploration game as “looking for new zones”, but it used to be so much more than that! As a result, the crafting community has largely gone by the wayside. I’d like to see what Crowfall can do to change that. This is spot on. So long as games are focused on rewarding players with the best gear through developer-created content and not player interaction, crafting will never have an important place as it had in past games. If crafted gear is better or equal to that dropped from bosses, then why kill the bosses? If crafted gear is worse, then why use it? These two systems have been at odds since their inception, and it’s incredibly promising to see a developer looking to bring crafting back as a viable primary activity. What do you propose to “bring back” crafting? I’m not claiming to have a silver bullet on this one, just some ideas based on years of playing and observation. There are a ton of lessons to be learned looking at games like Star Wars Galaxies and EVE Online which had and still have success with their crafting and economic loops. From a very high altitude, crafters need to be able to: craft unique items, explore new recipes and profit from the results of this exploration, and create customized items for all styles of play. Crafters must have an audience to buy their goods. The loop between crafter and combatant has to exist! And, ideally, crafters need to be able to “mark” their product so that they can build a social reputation and a following. The very concept that players can and will lose their items at some point is required, otherwise the game loop breaks. It is a very controversial topic for those who don’t like the potential of losing their items, and we understand that. But sometimes you have to embrace ideas that may not be popular at first glance, because they open up amazing areas of gameplay that are otherwise not accessible. On Crowfall, we’re willing to take some of these risks, because we know that the payoff will be worth the effort. You may have noticed earlier that the examples given for campaign rulesets included differing decay rules; well, this is where that comes back. Just think of it item-loss as being like strip poker, but with murdering each other instead of cards. Item loss on death or permanent decay are a staple mechanic in sandbox MMOs, where gear is used as a tool to advance gameplay and is not the ultimate goal of the endgame experience itself. While item loss may seem unthinkable to those coming from a background in gear-progression driven themepark environments, it can do well in a sandbox MMO, and is essential in keeping the economy alive. Another consideration is the effect of the sandbox economy on gear utility. As continual progression is not a focus of the game, the need for drastic increases in power with gear is not as important. While more difficult to obtain gear should provide noticeable statistical benefits as a risk vs reward component, it’s unlikely that a step up in item level in Crowfall will yield the severe benefits a step up in tier would yield in a PvE themepark like World of Warcraft. One of the more unique elements of Crowfall‘s economy is that they will not be shipping the game with a default currency. While the option will exist for players to create coins from ore and for the market to assign value to them, this system will remain entirely in the hands of the players. Presumably, this means that player shops will have the capability to set sell amounts in exchange for any in-game item. I’m on team Chickencoin. It’s worth noting that although telegraphs are featured prominently (way, way too prominently) in the video, that their appearance, and even their existence, are far from finalized. Though we know nothing of what their final form will be, their current eye-bleeding inducing form will likely not be around for long. The team knows the importance of getting combat right, and I’m sure we’ll see lots of changes as it moves forward from its current early-prototype phase. Crowfall is still very early in its development cycle, and it’s extremely easy to get swept up in the hype this early in a game’s development due to how much wiggle room we have to fill the gaps of our knowledge with assumptions and desires that likely won’t pan out. Still, Crowfall is looking extremely promising, and I’m finding what little we do know has been effective at sweeping me up on its merit alone. I believe in the concepts and objectives this game has, and I don’t believe games like this are going to be made by established companies who are looking to simply create products with as much market appeal as possible. Crowfall is undeniably a passion project – just check out this post by J. Todd Coleman if you need convincing – and this gives me confidence that the game’s current vision will survive the development process. The game has a long road ahead of it, but with a veteran team of developers who really believe in the game they’re trying to create, and, thanks to the wonders of crowdfunding, are unbeholden to a disengaged board of directors calling the shots, there’s a really good chance that Crowfall will make it down that road. Yea, though I walk through the valley of WoW clones, I shall fear no longer. Crowfall is currently targeting a December 2016 release date and will launch with a buy-to-play model of monetization; beta is currently estimated for mid-2016. There will be no NDA for its testing phases, so be sure to pay attention when they fire them up! Thank you! After having to dig through all of that to educate myself, I wanted to put it all in one place to make it easier for other people trying to learn about the game. Good stuff Isarii! I am glad you are not dead and writing here again. It’s definitely a PvP attraction though – don’t let yourself be convinced otherwise for the sake of the crafting system. If they can nail the SWG crafting experience it’ll probably be worth it, but I expect that even as a crafter, there’s going to be a lot of PvP action in the campaigns.